This chemistry dictionary offers the chemistry definitions starting with the letter U. These glossary terms are commonly used in chemistry and chemical engineering. Click the letter below to find the terms and definitions beginning with that letter. ultra high frequency – Ultra high frequency (UHF) is part of the electromagnetic spectrum in the radio waves region with frequencies between 300 and 3000 MHz. Also known as decimeter band because the wavelength is in the decimeter range. ultra low frequency – Ultra low frequency (ULF) is the part of the electromagnetic spectrum with frequencies between 300 and 3000 Hz. ultraviolet radiation – Ultraviolet radiation the part of the electromagnetic spectrum having a wavelength greater than 10 nm but less than 400 nm. Ultraviolet radiation has a wavelength longer than that of x-rays but shorter than that of visible light. Ultraviolet is energetic enough to break some chemical bonds. UN ID – A UN number or UN ID is a four-digit code used to identify flammable and harmful chemicals. UN numbers are assigned by the United Nations Committee of Experts on the Transport of Dangerous Goods and range from UN0001 to about UN3500. Example: The UN for acrylamide is UN2074. UN number – UN number is the same as UN ID above. unimolecular reaction – A unimolecular reaction is a chemical reaction involving only one molecule. Unimolecular reactions are either isomerizations (rearrangement of atoms in the molecule) or a decomposition into two or more pieces. unit – A unit is any standard used for comparison in measurements. Unit conversions allow for measurements of a property that have been recorded using different units (e.g., centimeters to inches). Examples: The meter is one standard of length. A liter is a standard of volume. Each of these standards can be used to compare with other measurements made using the same units. unit cell – A unit cell is the smallest unit of a crystal, which, if repeated, could generate the whole crystal. Example: The universal gas constant appears in the ideal gas law: PV = nRT. universal solvent – A universal solvent is a substance that dissolves most chemicals. Water is called the universal solvent because it dissolves more substances than any other solvent. However, no solvent, including water, dissolves every chemical. The general rule is “like dissolves like.” This means polar solvents dissolve polar molecules, such as salts. Nonpolar solvents dissolve nonpolar molecules such as fats and other organic compounds. unpaired electron – An unpaired electron is a single electron occupying an orbital by itself. unsaturated – For solutions, unsaturated means able to dissolve more solute into the solution. Unsaturated also can mean ‘can hold more liquid’. For organic compounds, unsaturated compounds contain one or more double or triple carbon-carbon bonds. Alkenes and alkynes are unsaturated compounds. unsaturated fat – An unsaturated fat is any lipid (fat) which contains one or more carbon-carbon double bonds. Natural unsaturated fats tend to be oily liquids obtained from plants. Examples: palmitoleic acid, oleic acid, myristoleic acid, linoleic acid, arachidonic acid. Foods which contain unsaturated fats include nuts, avocado, and olive oil. 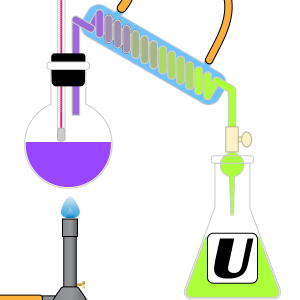 unsaturated solution – An unsaturated solution is a chemical solution in which the solute concentration is lower than its equilibrium solubility. All of the solute dissolves in the solvent and more could be dissolved if added. ununhexium – Ununhexium was the placeholder name for the element with atomic number 116, which is now known as livermorium. The symbol for ununhexium is Uuh. This name was replaced in 2011 by the name livermorium. ununoctium – Ununoctium is the placeholder name for the element with atomic number 118. This name was replaced in 2016 by oganesson. ununpentium – Ununpentium is the placeholder name for the element with atomic number 115. The symbol for ununpentium is Uup. This name was replaced in 2016 by the name moscovium. ununquadium – Ununquadium is the placeholder name for the element with atomic number 114. The symbol for ununquadium is Uuq. This name was replaced in 2011 by the name flerovium. ununseptium – Ununseptium is the placeholder name for the element with atomic number 117. The symbol for ununseptium is Uus. This name was replaced in 2016 by the name tennessine. ununtrium – Ununtrium is the placeholder name for the element with atomic number 113. The symbol for ununtrium is Uut. This name was replaced in 2016 by the name nihonium. uranium – Uranium is the name for the element with atomic number 92 and is represented by the symbol U. It is a member of the actinide group. useful work – The work produced during a change in state in excess of that required to achieve the change. Example: In the reaction H2O (l) → H2O (g), since the volume of the gas is larger than the volume of the liquid, work of expansion will be required to push back the air in order to make room for the water vapor. In this case, the useful work is the work done during the change which is in excess of the work of expansion.